Map 2.5. The Battle of Nisa, 1062. 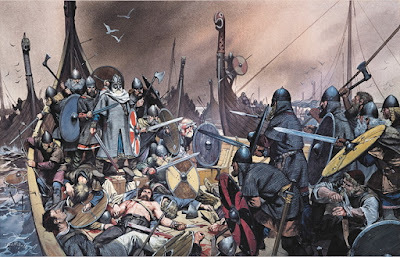 (a) Phase I: From his 70-oar drekkar, King Harald III Hardrada leads a 300-ship Norwegian fleet to an appointed location to battle King Sveinn Estridson’s Danish fleet. (b) Phase II: The Danes fail to arrive at the rendezvous at the appointed time, leading Hardrada to believe they have refused the challenge. He orders half of his fleet, containing his militia troops, to return home (1). The Norwegian fleet, reduced in number but crewed by Hardrada’s finest warriors, continues on (2). (c) Phase III: As half of Hardrada’s fleet sails out of sight, the Danes suddenly appear, 300 strong (1). Hardrada prepares to fight, ordering most of his remaining longships to be lashed together side by side (2). Two groups of vessels remain untethered to protect the Norwegians’ flanks (3). (d) Phase IV: Estridson follows the Norwegian lead and orders the Danish fleet to close up and rope together (1). The Danish king seizes the initiative and orders his fleet to row towards the enemy (2). 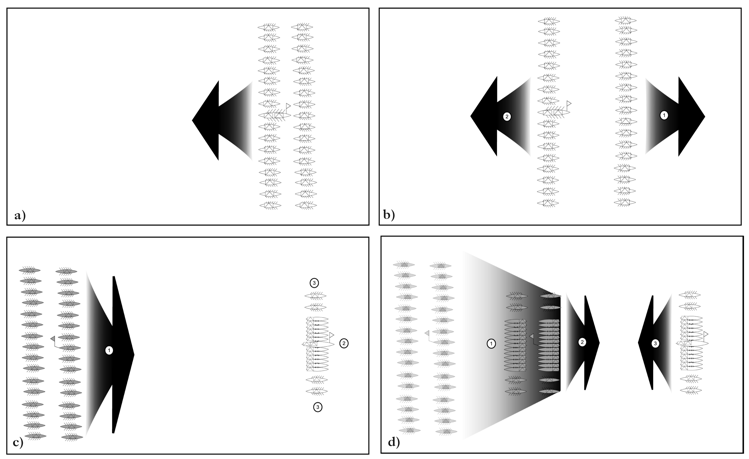 Hardrada orders his force to follow suit (3), and the two sides slowly close with each other as daylight begins to fade. (e) Phase V: The opposing lines clash, and the air is filled with arrows as Danish and Norwegian archers ply their deadly trade. The fight continues through the night, and neither side is able to gain a decisive advantage. (f) Phase VI: The deadlock is broken when one of the Norwegian flank elements under the command of Earl Hakon Ivarsson sails around the main battle and drives off the smaller Danish vessels (1). Several hours later, Hakon reinforces a failing flank (2) and drives back the Danes. The Norwegians offer no quarter and begin to clear the Danish vessels (3), boarding Sveinn Estridson’s flagship last (4). By dawn, seventy of the tethered Danish longships are cleared of opponents and the Norwegians are victorious, though Sveinn Estridson is able to escape. The primary instrument of Scandinavian overseas aggression was the longship. Long, narrow-keeled and flat-bottomed vessels with beautifully carved arched prows, the first longships carried around thirty-five warriors. They were made of oak using clinker construction (overlapping planks held together with clinch bolts) with a mast amidships and one bank of oars on each side. Controlled with two steering oars, these vessels had shallow draughts making it possible for them to navigate up rivers and along coastlines, giving the Vikings unprecedented strategic mobility. The Gokstad ship, built in the second half of the ninth century, was over 76 feet long and 12 feet wide, and drew less than 34 inches of water, giving it the ability to sail up rivers and estuaries into shallow waters only 3 feet deep. Longships were also easy to beach and portage over short distances using rollers and manpower. Having ordered the ships in a line, they joined them together with grapples, so that being bound together the fleet might easily ride down any enemy in its path. And when they were brought together for this purpose, they were joined together solidly, for flight or victory, as it would not be possible for anyone to break free from his colleagues. Thus they planned to make their weakness strong by this tactic. Not built for ramming, Viking ships could not duplicate the tactics of the ancient triremes, and so medieval sea battles usually consisted of closing on an opposing vessel, grappling the two ships together and then fighting in close quarters until one side was defeated, the enemy ship captured or, if damaged, scuttled. In the case of large engagements, one side chose to take the defensive by lashing their ships together, while the attacking navy either moved in on the tethered flotilla as individual ships, grappling, clearing and cutting away ships one by one, or attacked as a tethered armada itself. In these ship-to-ship battles, the Vikings attempted to match larger ships to smaller and favoured missile fire from bows and spears over hand-to-hand shock combat. Because of the nature of this attrition warfare, Viking sea battles tended to drag on far longer than engagements fought on land, often taking hours to conclude. One such long sea battle took place at Nisa on 9 August 1062 between the fleets of King Harald III Hardrada of Norway and King Sveinn Estridson of Denmark. This was the second battle between the two rival monarchs and seems to have been joined by mutual consent. Hardrada, unhappy about being unable to conquer Denmark despite successful annual raids, hoped for a large decisive victory over Estridson. Having raised a large army from the whole of Norway, Hardrada placed the men on 300 ships, leading the armada from his own seventy-oar drekkar (Map 2.5(a)). He sailed to the appointed spot at the prearranged time and waited for his Danish foe to arrive, but Estridson’s fleet was not there. Believing the Danes had refused battle, Hardrada dismissed the half of his ships containing the militia to return to their farms and prepared for another year of raiding (Map 2.5(b)). Those warriors who remained were the veterans of numerous raids, and some may have fought at Hardrada’s side during his days in Russia and Byzantium. One of the Varangian Guard’s more distinguished soldiers, Hardrada spent most of his twenties in the Byzantine emperor’s employment, rising to become the ‘leader of all of the Varangians’ and then returning to Norway to become king in 1047. But as half of the Norwegian navy sailed out of sight, the Danish fleet appeared, 300 ships strong (Map 2.5(c)). Refusing to flee from his numerically superior enemy, Hardrada ordered his remaining ships lashed together, placing his own ‘dragon ship’ in the centre of the line. Unfettered longships protected the flanks, including the warships of Earl Hakon Ivarsson. Mirroring the Norwegians, Estridson ordered his warships roped together in a line, his own ship in the centre, and seizing the initiative, rowed against the enemy (Map 2.5(d)). 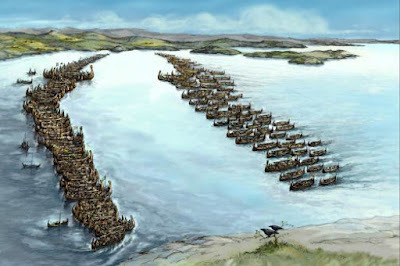 As the tethered Danish line slowly rowed forward, Hardrada ordered his own Norwegian fleet to meet the advancing Danes. The two bound Viking armadas clashed as the sun began to set. Hardrada’s prowess with a bow was not unusual, and Viking sources tell us that numerous Viking heroes died by missile fire, including Harold Bluetooth, King Hakon and, ironically, perhaps Harald Hardrada himself. The turning point came hours into the battle when Earl Hakon Ivarsson ordered his warships from their flanking position to sail around the main battle group and prey on smaller and weaker Danish vessels (2.5(f)). Hours later, Hakon’s warships buttressed a failing flank, forcing the Danes back. Sveinn Estridson’s warship was the last boarded. No quarter was given and those Danes not killed jumped overboard. By dawn Estridson’s fleet was defeated and no fewer than seventy of the Danish king’s tethered ships had been cleared. Estridson escaped the slaughter by jumping into the water and swimming for Hakon Ivarsson’s ship. Donning a disguise, the Danish king was brought on board and inexplicably led to shore on Hakon’s order, eventually escaping back to Denmark. Though initially recognized as the hero of the battle, the earl was quickly condemned by the Norwegian king and exiled. Ultimately, the battle of Nisa proved indecisive. Two years later, in 1064, the two kings signed a peace treaty ending years of Norwegian raiding, and King Harald Hardrada looked to the west for new lands to conquer. In 1066 a massive Norwegian fleet set sail for England in the last great invasion of the Viking age.